Liaoning (Simplified Chinese: 辽宁; Traditional Chinese: 遼寧; pinyin: Liáoníng) is a province of the People's Republic of China located in the northeastern part of the country. Liaoning borders the Yellow Sea (Korea Bay) and the Bohai Gulf in the south, North Korea to the southeast, Jilin to the northeast, Hebei to the west, and Inner Mongolia to the northwest. The Yalu River marks the border between North Korea and the Chinese provinces of Jilin and Liaoning. It empties into the Korea Bay between the cities of Dandong in Liaoning and Sinŭiju in North Korea. "Liáo," an ancient name for this region, had been adopted by the Liao Dynasty (Khitan Empire) founded by Abaoji, that ruled the area between 907 and 1125 C.E.. "Níng" means "peacefulness." 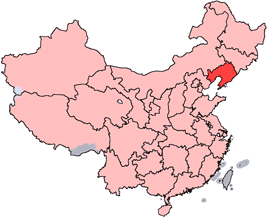 The modern province was established in 1907 as Fengtian province (奉天 pinyin: Fèngtiān; Postal map spelling: Fengtien) and the name was changed to Liaoning in 1929. Under the Japanese puppet Manchukuo regime, the province reverted to its old name, but the name Liaoning was restored in 1945 after the Japanese defeat and at the onset of the Chinese Civil War. The province's one-character abbreviation is Liao (辽 pinyin: liáo). The province was significant in the founding of Korea and during the first 3000 years of Korea's history. Liaoning, far from the centers of power in China, represented a wilderness that could hide renegade tribes that wanted to overthrow the current Chinese dynasty and also served as a region to create a new kingdom beyond interference from China. Some scholars speculate that Korea could have originated from Chinese immigrants unhappy with the dynasty's rule who sought to create their own kingdom on the Korean peninsula. Dangun (2333 B.C.E.) and Gija (1222 B.C.E.) could have been Chinese officials who traveled to the area of present-day Liaoning to establish their own kingdoms. The kingdoms of Gojoseon and Goguryeo followed from them, playing a key role in shaping Korean civilization. Present-day Liaoning province is located in the southern part of China's Northeast. The Qin and Han dynasties were able to establish rule over much of the area of Liaoning, but later on the Gojoseon, Xianbei, Goguryeo, Khitan, and Jurchen all ruled Liaoning at various times. In the seventeenth century, the Manchus established their capital in modern-day Shenyang, Liaoning, before they conquered the rest of China and set up the Qing Dynasty in 1644. In the last half of the seventeenth century, the imperial government recruited migrants from Shandong to settle the relatively sparsely populated area. Many of the current residents of Liaoning trace their ancestry to these seventeenth century settlers. For the rest of the Manchu era, China's northeast was off-limits to Han Chinese immigration, and was ruled by three generals, one of whom, the General of Shengjing, ruled much of modern Liaoning. In 1860, the Manchu government began to reopen the region to migration, which quickly resulted in Han Chinese becoming the dominant ethnic group of the province. In the twentieth century, the province of Fengtian was set up in modern day Liaoning. When Japan and Russia fought the Russo-Japanese War in 1904-1905, many key battles took place in Liaoning, including the Battle of Port Arthur and the Battle of Mukden, which was, to that point, the largest land battle ever fought. During the Warlord Era in the early twentieth century, Liaoning was under the Fengtian Clique, including Zhang Zuolin and his son Zhang Xueliang. In 1931, Japan invaded and the area came under the rule of the Japanese-controlled puppet state of Manchukuo. The Chinese Civil War that took place following Japanese defeat in 1945 had its first major battles (the Liaoshen Campaign) in and around Liaoning. At the founding of the People's Republic of China in 1949, Liaoning did not exist. Instead, it was made up of two provinces, Liaodong and Liaoxi, as well as five municipalities, Shenyang, Luda, Anshan, Fushun, and Benxi. All of these entities were merged together into "Liaoning" in 1954, and parts of former Rehe province were merged into Liaoning in 1955. During the Cultural Revolution, Liaoning also took in a part of Inner Mongolia, though this was reversed later on. Liaoning was one of the first provinces in China to industrialize, first under Japanese occupation, and then even more in the 1950s and 1960s. The city of Anshan, for example, is home to one of the largest iron and steel complexes in China. In recent years, this early focus on heavy industry has become a liability, as many of the large state-run enterprises have experienced economic difficulties upon adopting the liberalization reforms of the 1970s. Recognizing the special difficulties faced by Liaoning and other provinces in Northeast China because of their heritage of heavy industry, the Chinese central government recently launched a "Revitalize the Northeast" Campaign. Liaoning can be roughly divided into three main geographical regions, with highlands in the west, plains in the middle, and hills in the east. The highlands in the west are dominated by the Nulu'erhu Mountains, which roughly follow the border between Liaoning and Inner Mongolia. This entire region is dominated by low lying hills. The central plains of Liaoning consists of the watersheds of rivers such as the Liao, the Daliao, and their various tributaries. This region is mostly flat and lies at low altitudes, with abundant water and fertile soil, making it the main farming area and commodity grain base in Liaoning. The eastern part of Liaoning is dominated by the Changbai Shan and Qian Shan ranges, which extend into the sea to form the Liaodong Peninsula. The highest point in Liaoning, Mount Huabozi (1,336 m.), is found in this region. Liaoning has a continental monsoon climate, and rainfall averages to about 440 to 1130 mm annually. Summer is usually rainy while the other seasons are mostly dry. Liaoning has the largest economy in northeastern China. Its nominal GDP for 2006 was 925.7 billion yuan (US$117.2 billion), making it the 8th largest in the country. Its per capita GDP was 21,802 yuan (US$2,760). Some of the province's main agricultural products include maize, sorghum, cotton, and soybeans. In addition, the region around Dalian produces three-quarters of China's exported apples and peaches. Liaoning's other fruits include pears from Beizhen of Jinzhou, white pears from Huludao and Suizhong, and apricots and plums from Gushan of Dandong. Liaoning as a whole has plentiful fishing resources with its marine life area ranking second in China. The sea off the coast of Dalian abounds with quality seafood, including abalones, sea cucumbers, scallops, prawns, crabs, and sea urchins. The big fish of Dandong, the jellyfish of Yingkou, and the clams of Panjin are known worldwide for their good taste right from the sea and in a variety of products made in Liaoning for export domestically and internationally. In addition, large quantities of salt are produced along the coast. Liaoning has the most iron, magnesite, diamond, and boron deposits among all of the provinces of China. This mineral resource base has contributed strongly to Liaoning's position as one of China's most important industrial bases, covering a wide range of industries, such as machinery, electronics, metal refining, chemical industries, construction materials, coal, and others. Along with these industries, Liaoning is also an important source of petroleum and natural gas, with the Liaohe Oil Field serving as the third largest oil and natural gas field in all of China. Its reserves account for 15 percent of the country's total oil and 10 percent of the country's total natural gas. The cities of Dalian and Yingkou both have been developed as major ports and economic gateways for all of northeast China. The Party Secretary of the Liaoning Provincial Committee of the Communist Party of China, Li Keqiang, initiated the development of a strategy entitled “Five Points, One Line,” which he first proposed on a visit to Yingkou in late 2005. Liaoning formally launched the development strategy for the entire Liaoning coastline in early 2006, so as to re-invigorate the provincial economy from its traditional status as the “rustbelt” of Chinese state-owned enterprises. The "Five Points" indicate five key development areas in the province and cover seven zones: the Changxing Island Harbor Industrial Zone in Dalian, the Yingkou Coastal Industrial Base, the Liaoxi Jinzhou Bay Coastal Economic Zone, Dandong, and the Zhuanghe Huayuankou Industrial Zone. The five zones together cover a planned area of nearly 500 square kilometres. The "One Line" aspect of the strategy represents a new motorway along the coast which will connect all of these various developing economic areas. The coastline of 1,433 kilometers will become the main connection between the five zones, through which 6 provincial cities, 21 counties, and 113 towns will be interlinked. The new coastal motorway will directly connect the entire rim of five zones around the Bohai Sea, and will be completed by 2009. The population of Liaoning is mostly Han Chinese, but it also includes 44 different ethnic minority groups including Manchus, Mongols, Hui, Koreans and Xibe. The overall minority population is 6.55 million, accounting for 16 percent of the province’s total. Within this total, there are five minority groups with populations exceeding 10,000: the Manchus, the Mongols, the Hui, Koreans and the Xibe. In addition to these five, the population of the Zhuang, Miao, Tujia, Dawo’er, and Yi ethnic groups is also fairly large, relative to some of the other more homogeneous provinces in China. Education has developed rapidly in Liaoning since the founding of the People's Republic of China in 1949. As a result, the proportion of the population with various educational levels has changed notably over the past few decades. In 2000, there were a total of 58 institutions of higher learning with 297,710 students and 61,707 faculty. There were also 2,401 secondary schools with 2.167 million students and 175,455 teachers and 13,356 primary schools with 4.621 million students and 216,677 teachers. The proportion of illiterate and semi-literate persons in relation to the entire population has decreased drastically, with an illiteracy rate of 4.76 percent in 2000, amounting to about 2.02 million people. While the educational increase has been promising, there still remains a low proportion of people with higher learning, which must be improved in order to keep up with the province's rapid economic development. Part of the PRC's goal with their "Revitalize the Northeast" campaign is to help improve education in these areas, so that should help Liaoning and other provinces in the region moving forward into the future. Liaoning's culture is part of a culture of Northeast China that is quite homogeneous across all of the areas, and is heavily influenced by the Manchu presence historically. In terms of paleontology, Liaoning is well known for its extraordinary fossils from the Lower Cretaceous period; e.g., the early 'placental' mammal known as Eomaia. The first widely acknowledged feathered dinosaur, Sinosauropteryx prima, was discovered in Liaoning and unveiled at a scientific meeting in 1996. Other notable discoveries have been an intact embryo of a pterosaur, Repenomamus robustus—a cat-sized mammal who ate dinosaurs, and Sinornithosaurus millennii, nicknamed "Dave the Fuzzy Raptor." Chongzheng Hall in the Mukden Palace. Liaoning is home to several prominent historical, cultural and religious sites, many of whom have had the distinction of being named to the UNESCO World Heritage Site list. Wunu Mountain City, a Goguryeo site found in [[Huanren Manchu autonomous county|Huanren Manchu Autonomous County]], is part of a combined UNESCO World Heritage Site that also includes sites in Ji'an, Jilin. 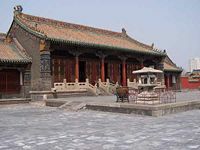 The Mukden Palace was the palace of the Qing Dynasty emperors before they conquered the rest of China and moved their capital to Beijing. 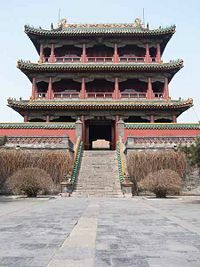 Though not as large or famous as its counterpart (the Forbidden City) in Beijing, the Mukden Palace is significant for its representation of palace architecture at the time, and has recently been included on the UNESCO World Heritage Site as an extension of the Imperial Palace site in Beijing. In addition to this, three imperial tombs dating from the Qing Dynasty are located in Liaoning. These tomb sites have been grouped with other Ming and Qing Dynasty tombs (such as the Ming Dynasty Tombs in Beijing, and the Ming Xiaoling Mausoleum in Nanjing) as a combined UNESCO World Heritage Site. Liaoyang, one of the oldest continuously-inhabited cities in northeast China, has a number of historical sites, including the White Pagoda (Baita), that dates back to the Yuan Dynasty. 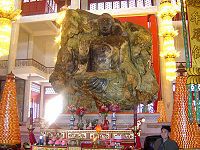 Anshan boasts the Anshan Jade Buddha, the largest Buddha statue made of jade in the world, weighing 260 tons. Benxi offers a boat ride though a stalagmite-filled cave and underground river. The port city of Dalian, located on the tip of the Liaodong Peninsula, is a notable tourist destination in its own right, with a variety of beaches, resorts, zoos, seafood, shopping, Russian- and Japanese-era architecture, and various other sights. Throughout various points in the year, Liaoning celebrates a number of different special festivals, including the Dalian Spring Fireworks Festival, the Dalian Chinese Scholar Tree Blossom Affairs, the Dalian International Fashion Festival, and the Shenyang International Ice and Snow Festival. ↑ 中国各省及自治区名称历史由来和变化 (in Simplified Chinese). The People's Daily Online. Retrieved January 26, 2012. This page was last modified on 4 July 2018, at 20:38.